Am feeling a bit skewif, as all I can find for breakfast is some Green & Black's ginger chocolate and so my blood-sugar levels are a bit wonky. All the coffee hasn't helped, I'm sure. Gonna have to send Tom out for some bread and milk. Managed to get my brain in gear on friday and suss out how I wanted to make the Lopi coat. Now I luuurrrve Lopi. I know it's not everyone's cup of tea and for some folk the mere thought of wearing it next to their skin brings them out in hives. But I can't get enough of it. It's kinda more organic than some wools; sorta makes you feel closer to the animal it came from. It's harsh and warm and felts a wonder. I have sensitive skin, mainly added chemicals in soaps, washing liquids and the like but wool is no issue. I can wear any of it, me. I had a good crack at the top-down-all-in-one-raglan pattern I've mashed together. 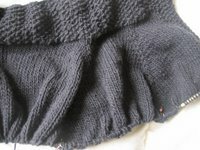 It's a change from all the quick-knit hats I've been making, as the raglan increases are taking their time. Last night though, there was a scary realisation - haven't got enough wool. 2kg of the stuff should be enough, but this stuff is a heavy, dense wool and shouldn't think it has great yardage. Panic. Then I remembered that hand-dyed thick/thin wool I bought from Silkwood Yarns at Ally Pally - only got 4x100g skeins of it, but it should be enough to re-do the collar, trim the cuffs, pockets and finish off for the hem. Now I'm not normally keen on coats with a contrasting trim as often they look like an after thought.... yet the tones of these two yarns sit beautifully together (well, I think they do) Ok, so there's a slight difference in gauge, but I'll work that out. Still not sure if I'll get my hood....but it's not as if I'm short of things to keep my head warm, eh? The first of my Ebay orders arrived yesterday - 1kg of pure wool undyed aran for a tenner, including postage. Nice one. It's not labelled but a quick burn test proved it's fibre content, and the quality feels reasonably good. I made up a quick sample which I've stuck in with the wash to see how it felts. Will also do a dyed sample too. The seller has more of this wool, so if it produces good test results I'll be back for more. I owe a fair few visits in Blogland; need to pop in to a few folks' blogs and see what they've been up to and say hello. Need food first though.